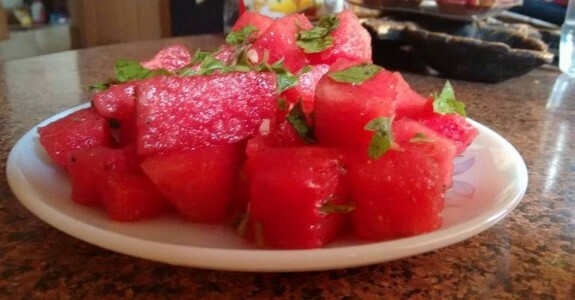 In this warm weather of summer, watermelon has already started to pop up in the market with its juicy sweet texture. So, add this fruit in your dessert or use its versatility in salad with basil leaves to have a refreshment day. 1. Keep the watermelon in refrigerator for 1-2 hour. 2. Cut the chilled watermelon into cubes and keep it in a big bowl. 3. Sprinkle black salt, Chaat masala powder, black pepper powder and olive oil. Mix everything properly. 4. Add chopped basil leaves and mix everything well.